Many of you will be returning for the 6th Annual Anything for a Friend F2TF 5k. 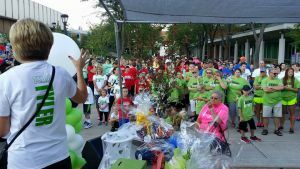 Returners are well aware of the story that brought this all together, but for those of you that are new, we would love to share the special story behind why we are doing what we are doing and the uniqueness of this 5k. 6 years ago this coming May, this world lost a unique and special person and his name was Tyler Smith, he was only 15 years old when he died. Tyler waged a battle with an adult liver cancer that literally strikes one in a million kids. He was truly one in a million! F2TF (Fight to the Finish) was Tyler’s mantra right from the beginning of his battle and has become part of his lasting legacy. That legacy is at the heart of this Annual 5k. There has been an outpouring of sentiment, stories, and touching gestures surrounding the F2TF slogan and it has become a burning mission of Anything for a Friend to share Tyler’s message of fighting to the finish in a more powerful and widespread manner. There is a clear and simple connection between the FIGHT TO THE FINISH battle cry and the conflict waged in the middle of a run. Tyler understood that everyone’s fight was different, but we all had a conscious decision to make, to stand up and fight, or sit down while life passed before our eyes. Life is beautiful and life is difficult, the Anything for a Friend F2TF 5K is about a conscious choice to FIGHT and persevere through the difficult challenges of life. This 5K brings together the true champions who have fought, are fighting, or have painfully desired to fight for another. It is a hallowed expression about the undeniable resilience of the human spirit; of our irrefutable need to garner HOPE when hope and peace seem distant! Thank you Tyler for teaching us about the power of fighting through the hard. We honor you and our loved ones in the 6th Annual Anything for a Friend F2TF 5K by truly REMEMBERING! We will be holding a special balloon launch and butterfly release in memory and celebration of our loved ones just prior to the start of the 5K. This is how it will work! We will be holding the 6th annual Anything for a Friend--F2TF 5K on July 28th at Weber State University. Same day registration: $40, (shirt not guaranteed). A team does not need to be comprised of past or current Anything for a Friend recipients, but is offered to any group wanting to make an expression of love and support. If a team has 25 registrants or more, AFAF will print a team specific t-shirt (i.e. TEAM “LOVED ONE”) with color specific to the team. Group registration of 24 and under will receive a General Registration t-shirt—Angels and Avengers! The team totals will be displayed on the website so you will know if you are hitting your goal. CLICK HERE TO REGISTER ONLINE TODAY!!! If you would like to give words of encouragement to 5th Annual 5K, please do so below! © 2019 SITE, All Rights Reserved.